Solid organs complete the dichotomy that was started with hollow organs. Their colloquial description is cube. The solid organs of the body include the kidney, liver, pancreas, breast, lung and many head and neck excisions (such as the tongue, mandible and buccal mucosa). The term solid is analagous rather than anatomically accurate. Many of these organs contain a network of small acinar / ductular / alveolar spaces but these are usually only appreciated at the microscopic level. The lung is the most cogent example of this phenomenon. Skin excision specimens also fall into the category of solid organ tumours. (It should be noted that the term 'solid tumour' is more commonly used to denote any tumour that is not haematological in origin). The solid organs of the body can be conceptualised as a polyhedron that has six faces. The six faces of the polyhedron can generally be orientated in relation to the anatomical planes of the body by the designations of superior and inferior, medial and lateral, anterior and posterior; medial and lateral may sometimes be better described as left and right (or right and left). In some instances, one of the pairs may be replaced by the terms superficial and deep. If all or part of the surface of the organ / specimen is curved (for example the kidney), the junction between the anatomical zones may be somewhat arbitrary and the paradigm of six separate faces may blur into a smaller number. Usually five or six of the faces of the cuboid constitute a surgical margin. In those specimens that have only five margin faces (such as a mastectomy, ellipse of skin or hemiglossectomy) the sixth face is typically an external surface (for example the epidermis of a skin ellipse or mastectomy, or the mucosa of a hemiglossectomy). As such it constitutes neither a margin nor a staging surface. For some solid organs, of which the kidney is one example, the relevant margin parameter is the just the degree of closest approach to the nearest of the faces, with the precise orientation of this proximity being of limited value. Conversely, in head and neck or breast wide local excision specimens, specific reference to all faces is vital. The diagram of a simplified solid organ that contains a tumour illustrates the basic concept and distances from the tumour to the resection margins (green bars). The green bars also indicate where blocks could be taken to evaluate each of the six margins. The detailed evaluation of up to six specific margins has two main function. The first is to enable further surgery to be targeted if the excision margins on the initial specimen are involved or inadequate. Secondly, indicating the precise margin that is involved or inadequate gives feedback to the surgeon, particularly if that margin was close to another structure that the surgeon was trying to spare. Assigning anatomical designations to the margins is only possible if the specimen can be orientated with respect to the anatomical planes of the body. This requires anatomical landmarks on the specimen to be present and identifiable, the side from which the specimen was obtained to be stated and frequently markers (usually sutures) to be placed on the specimen to label the planes. The degree of labelling varies between specimens; a hemimandibulectomy could be orientated solely on the basis of its anatomy while a breast wide local excision would require the side from which the specimen was obtained to be stated and all three planes to be marked. Solid organ specimens frequently feature a duct or similar draining or feeding tubular organ that arises from or terminates in the solid organ and serves to allow the product of that organ to be removed/distributed (such as urine) or to deliver substances to the organ for processing. For example, the kidney is drained by the ureter which arises in the renal pelvis; air is delivered to the lung by the bronchus. These tubes have to be cut to allow the organ to be removed and not only constitute a margin but may also contribute to the stage. The major blood vessels of a solid organ have a similar pathological significance as the draining/supply tube. In addition, a specimen that has the latter often has the former. The blood vessels may contribute to the stage (kidney) or the excision margins. They may be located in the same place as the tube (the hilum of the lung contains the blood vessels and the bronchus) or at a different location (the cut end of the ureter is not in the same place as the cut ends of the renal artery and vein). The T stage of a solid organ tumour usually relates to the size of the primary tumour and its relationship to any other adjacent organs or structures that are in continuity with the solid organ. The T1 and T2 stages tend to depend on the size while involvement of adjacent tissues denotes either stage T3 or T4. The lymph nodes for a solid organ are often sent separately, although a few may be attached to the main tumour specimen, frequently around the blood vessels and tube. 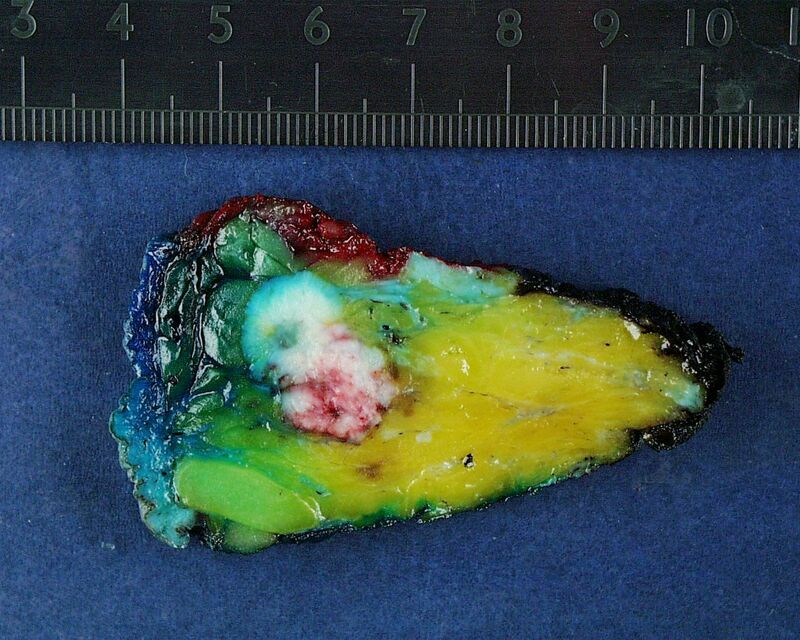 This slice from a wide local excision of a breast exhibits an irregular, white tumour that would be firmer than the adjacent fatty breast tissue. A small zone of fibrous breast tissue is present at the centre of the upper margin of the slice. Different coloured inks have been used to mark the margins. As well as enabling the margins to be orientated on the slides, the inking ensures that the orientation of the slices is preserved during the cut up. Four of the six face margins can be sampled from this one slice. The lobectomy specimen displays an irregular, light grey tumour that possesses a variegated cut surface. The tumour abuts the pleural surface on what would have been the lateral surface of the lobe of the lung. The lung elsewhere has its normal spongy appearance. Blood clot is present at the cut end of the pulmonary artery but is likely to be secondary to the process of surgery; sampling this cut end will exclude the presence of tumour. The kidney has been removed within its perinephric fat. This is standard in a total nephrectomy because extension of the renal tumour into or through the perinephric fat defines the higher T stages. The kidney contains a large tumour that has a yellow and light grey cut surface which features regions of haemorrhage. Towards the middle of the specimen the distinction between the tumour and the adjacent kidney is poor. The tumour does not seem to extend beyond the renal capsule into the perinephric fat. 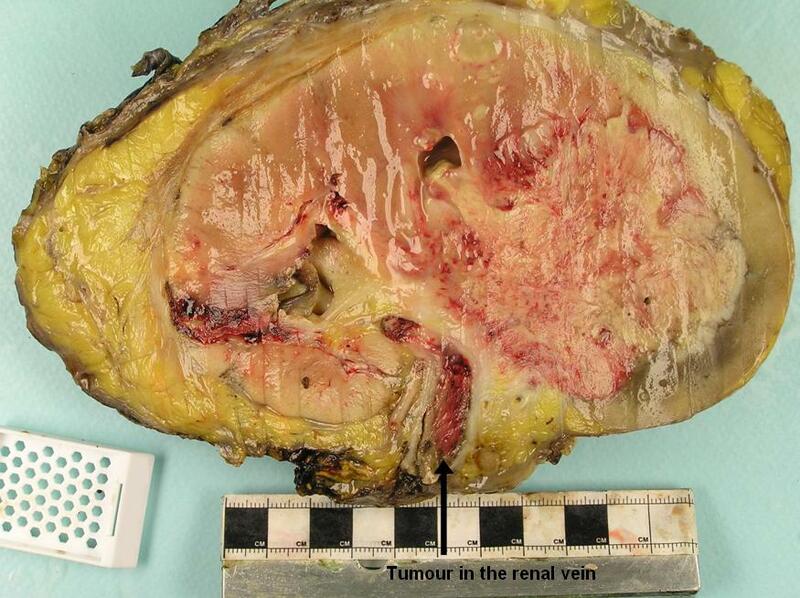 Tumour is visible in the renal vein (which is another staging parameter). The description of a solid organ should give the overall dimensions of the main body of the specimen. This will often be the measurements of the organ itself but in some cases, like a nephrectomy removed with the surrounding fibrofatty tissue, the organ is contained with additional tissue and so the organ must be measured separately. Both sets of measurements should be in three dimensions. The length and diameter / circumference of the tubular organ should be given. Where assessment of each of the margins is required, the specimen should be inked with different colours in order to mark the margins. The size of the tumour should be measured in three dimensions. The position of the tumour in the organ should be stated and its relationship to any margins and attached structures determined. If the specimen is divided into multiple sequential slices it is helpful to number the slices for ease of reference during the block key. Measurement of the two dimensions of the tumour that are contained within the plane of the slices is straightforward. Similarly, the distances to four of the six faces can be evaluated in the plane of the slices. 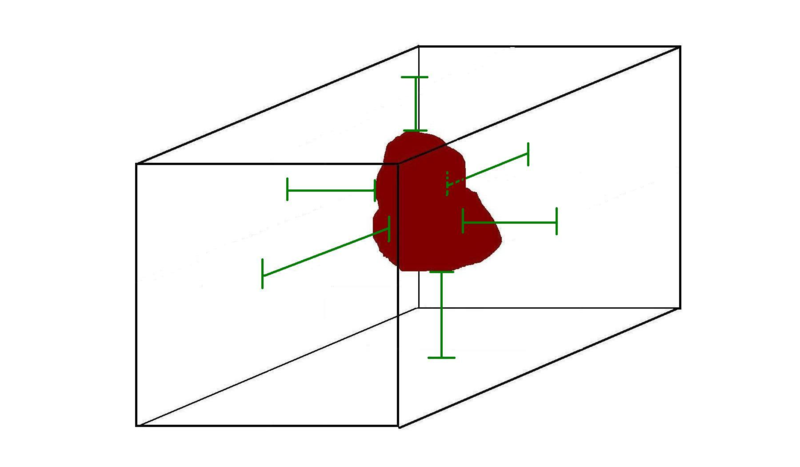 However, the remaining third dimension of the tumour and the distances to the final two faces exist across the slices (in other words in a plane perpendicular to that of the slices) and can only be determined by measuring and adding together the thickness of all of the relevant slices that contain the tumour or margin distance. The background tissue should be assessed. An example description for a breast wide local excision specimen is as follows. The specimen comprises a portion of fibrofatty tissue that measures 50mm in superiorly to inferiorly, 40mm from medial to lateral and 25mm from superficial to deep. The weight of the specimen is 90g. Three sets of orientating sutures are present. The specimen has been divided from medial to lateral into nine slices, with the medial slice being slice one. Located in slices four, five and six is a firm, white, irregular tumour that measures 30mm by 12mm by 12mm. The tumour is 10mm from the superior and inferior margins, 15mm from the medial margin, 13mm from the lateral margin, 6mm from the superficial margin and 7mm from the deep margin. The medial margin has been inked blue, the lateral margin inked green, the superior margin inked red, the inferior margin inked yellow, the superficial margin inked orange and the deep margin inked black. A macroscopic description for a lung lobectomy could be as follows. The specimen is a lobectomy that measures 130mm by 85mm by 35mm. The bronchus extends for 7mm beyond the hilar surface of the lung parenchyma. Located 15mm from the end of the bronchus is a light grey, firm, irregular tumour that measures 35mm by 20mm by 20mm. The tumour is 60mm from the superior pleural surface, 30mm from the inferior pleural surface, 20mm from the anterior pleural surface, 20mm from the posterior pleural surface, 35mm from the lateral pleural surface and 5mm from the medial (mediastinal) margin. 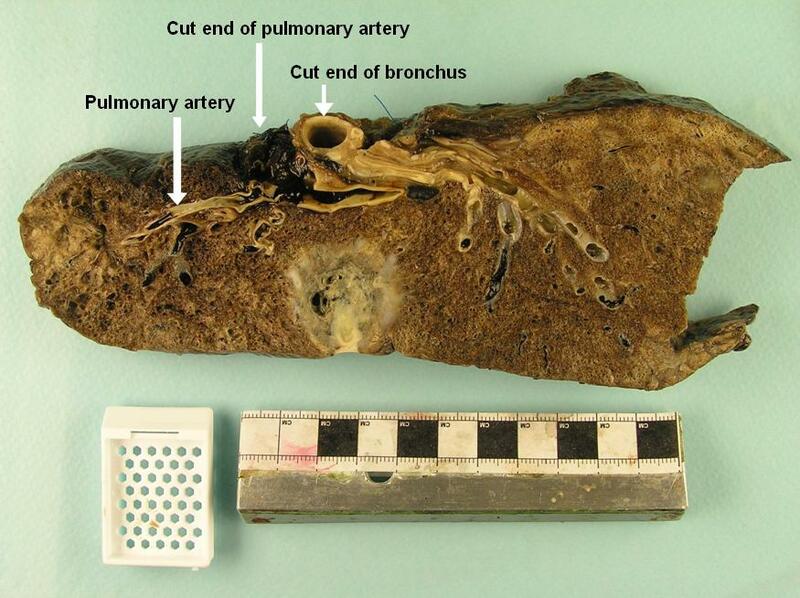 The lung away from the tumour appears unremarkable (other than anthracosis). Four lymph nodes are present at the hilum of the lung, together with unremarkable blood vessels. A radial nephrectomy specimen would require a slightly different approach to its description. The specimen comprises a kidney with the surrouding perinephric fat. Overall the specimen measures 100mm by 60mm by 70mm. The kidney measures 60mm by 30mm by 30mm and has an attached segment of ureter that is 30mm in length and has a diameter of 5mm. The adrenal gland is included in the perinephric fat and measures 30mm by 15mm by 10mm and appears unremarkable. Slicing the kidney reveals an orange tumour that shows haemorrhage and cystic change. The tumour measures 35mm by 20mm by 20mm and is located in the lower pole. The tumour distorts the renal capsule but does not seem to extend into the perinephric fat. The tumour is 5mm from the renal pelvis. The renal blood vessels are unremarkable. As with hollow organs, the system of taking of blocks from solid organs has general principles that will apply to most specimens in this category. The blocks of the tumour must allow the type of tumour to be determined and its relationship to all margins. The margin blocks are typically cruciate rather than en face. The blocks that are taken to accomplish these aims will usually suffice to evaluate other important parameters such as lymphatic invasion, vascular invasion, perineural invasion and immunohistochemical properties. One or more of the margins may be sufficiently far away from the tumour that it is not possible to include both the tumour and this margin in a conventional sized cassette. Under these circumstances either a megablock can be employed or one or more longitudinal blocks taken from the margin that are as large as possible still to fit comfortably in the cassette. These blocks will give around 25mm of the distance from the margin back towards the tumour. If this 25mm is clear that is more than adequate for the vast majority of tumours and also implies that the macroscopic measurement of this margin is likely to be accurate. Even though sampling the margins may generate several or more blocks that contain part of the tumour, it is important to have at least two blocks that focus on the tumour and are thus composed mainly of tumour, rather than the normal tissue that can constitute the majority of a margin block. If the margins are macroscopically considerably clear of the tumour, the number of tumour only blocks should be increased to at least four. It is important to state in the block key if a block does not contain a margin.